← Why You Should NEVER let your Dog Lick You! In other words- EAT for Fruits and Veggies- and plenty of them. No, suppleness DO NOT take the place of real, live food! You are what you eat, the old saying goes, but why is that so? 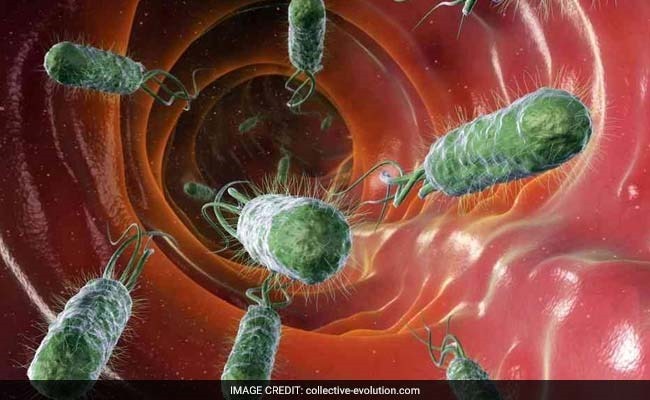 Researchers have known for some time that diet affects the balance of microbes in our bodies, but how that translates into an effect on the host has not been understood. Now, research in mice is showing that microbes communicate with their hosts by sending out metabolites that act on histones–thus influencing gene transcription not only in the colon but also in tissues in other parts of the body. The findings publish November 23 in Molecular Cell. “This is the first of what we hope is a long, fruitful set of studies to understand the connection between the microbiome in the gut and its influence on host health,” says John Denu, a professor of biomolecular chemistry at the University of Wisconsin, Madison, and one of the study’s senior authors. “We wanted to look at whether the gut microbiota affect epigenetic programming in a variety of different tissues in the host.” These tissues were in the proximal colon, the liver, and fat tissue. In the study, the researchers first compared germ-free mice with those that have active gut microbes and discovered that gut microbiota alter the host’s epigenome in several tissues. Next, they compared mice that were fed a normal chow diet to mice fed a Western-type diet–one that was low in complex carbohydrates and fiber and high in fat and simple sugars. Consistent with previous studies from other researchers, they found that the gut microbiota of mice fed the normal chow diet differed from those fed the Western-type diet. “When the host consumes a diet that’s rich in complex plant polysaccharides (such as fiber), there’s more food available for microbes in the gut, because unlike simple sugars, our human cells cannot use them,” explains Federico Rey, an assistant professor of bacteriology at UW-Madison and the study’s other senior author. Furthermore, they found that mice given a Western diet didn’t produce certain metabolites at the same levels as mice who ate the healthier diet. “We thought that those metabolites–the short-chain fatty acids acetate, propionate, and butyrate, which are mostly produced by microbial fermentation of fiber–may be important for driving some of the epigenetic effects that we observed in mouse tissues,” Denu says. To confirm that the metabolites were driving the epigenetic changes, the investigators then exposed germ-free mice to the three short-chain fatty acids via their drinking water to determine if these substances alone were enough to elicit the epigenetic changes. After looking at the mice’s tissues, they found that the epigenetic signatures in the mice with the supplemented water mimicked the mice that were colonized by the microbes that thrive on the healthy diet. Molecular Cell (@MolecularCell), published by Cell Press, is a bimonthly journal that focuses on analyses at the molecular level, with an emphasis on new mechanistic insights. The scope of the journal encompasses all of “traditional” molecular biology as well as studies of the molecular interactions and mechanisms that underlie basic cellular processes. Visit: http://www.cell.com/molecular-cell. To receive Cell Press media alerts, please contact press@cell.com.